Explore the fascinating world of science and technology with your favorite American Girl characters. What are the bubbles in your bathtub made of? Why are lemons sour? What makes guitars twang and cymbals clang? Join the girls as they show us how science can explain the wonders of the everyday world around us. Many of the things that today's girls enjoy, from camping to cooking, or singing to stargazing, can be used as a starting point to delve into science. Themed pages covering nature, chemistry, physics, astronomy, and much more, are packed with images of the American Girl dolls and their accessories, as well as clear photos and explanations of real-life science. 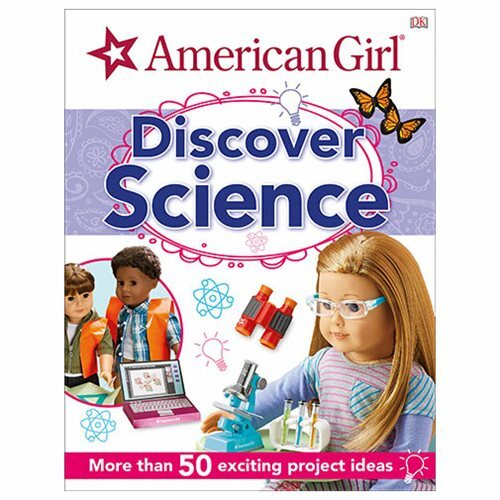 This American Girl: Discover Science Hardcover Book contains more than 50 inspiring ideas that can be developed as science fair projects-or just for fun at home! With American Girl as inspiration, science has never been more fun! The American Girl: Discover Science Hardcover Book has 64 pages. Measures about 10 3/5-inches tall x 7 9/10-inches wide. Ages 8 and up.